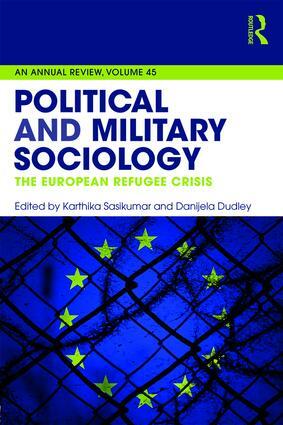 This special edition of Political and Military Sociology: An Annual Review encompasses a full range of coverage on the European refugee crisis. Contributions include a focus on the characteristics and motivations of modern-day migrants, an analysis of the inconsistent standards displayed by the European Union, and the militarization happening across parts of Europe in response. The volume leads with a discussion on the identity of the refugees: who are they and what are their reasons for leaving their homelands? Following chapters cover the response across Europe in countries including Serbia, Greece, Turkey, and Italy. The penultimate chapter examines the European Union’s inadequate response to the unfolding crisis, and the book concludes with a central analysis of the agreements between the EU and transit countries with remarks on the unintended consequences that have emerged.